Pity poor Monday, it’s the most maligned day of the week. Everything from movies to songs to comic strips have traded on the universal hatred for the beginning of the work week. In No More Mondays: Fire Yourself — and Other Ways to Find Your True Calling at Work, author Dan Miller seeks to free readers from the infamous Monday morning dread. Pity poor Monday, it’s the most maligned day of the week. Everything from movies to songs to comic strips have traded on the universal hatred for the beginning of the work week. In No More Mondays — Fire Yourself and Other Ways to Find Your True Calling at Work, author Dan Miller seeks to free readers from the infamous Monday morning dread. According to Miller, everyone has a “calling” and the way you spend your time should serve that calling and communicate your values and priorities to the world. Failure to do so results not just in job dissatisfaction, but also in a soul-deep discontent. You owe it to yourself, and the world around you, to fulfill your potential, he contends. 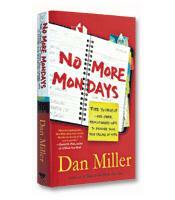 To do this, Miller encourages readers to become “revolutionary” by restructuring and redefining their working life. He makes a compelling case against the confines of the 9 to 5 routine and each chapter offers “revolutionary insight” geared toward inspiring and guiding readers as they determine the best way to free themselves from that outdated paradigm. Your personal revolution may be as small as rearranging your hours at work to allow you more time to devote to your family and community or as grand as quitting your job to start your own business. He devotes some lines to exploring the new ways of working (telecommuting, flexible hours, etc.) and spotlights some jobs with built-in flexibility, such as sales and consulting. Mostly, however, Miller encourages readers to break out on their own and become entrepreneurs (or Eaglepreneurs, as he likes to call them). He examines some of the avenues for self-employment and provides copious examples of individuals, both famous and not, who have turned their passions into profit. In addition, the book is replete with pithy inspirational quotes from famous thinkers and doers as diverse as Steve Martin and Benjamin Disraeli. The author frequently recounts advice and anecdotes from other business writers and motivational speakers such as Stephen Covey and Zig Ziglar, as well as drawing from his own life and previous book, 48 Days to the Work You Love. Which illustrates the book’s biggest failing — a lack of “how-to.” While it may inspire a reader to change their way of working, it doesn’t set out a blueprint for precisely how to do it. It provides useful advice to guide one on the road, such as what types of financing are available for start-up business and different methods of getting paid, and many of the resources included in the back of the book could be helpful. However, it falls short of providing a clear roadmap. Readers looking for a cheerleader to inspire them as they make big changes may be buoyed by Miller’s positive attitude and uplifting anecdotes, however readers looking for a tour guide to lead them through a stressful and often confusing process may need to look elsewhere.